What is a UPS Access Point? The UPS Access Point network offers a convenient, fast and efficient alternative to home delivery. You can collect your parcel from a UPS Access Point location chosen by you and at a time that fits your daily routine. Locations include newsagents, petrol stations and convenience stores. UPS Access Points offer a broad range of opening hours (e.g. early in the morning, late in the evening, during the weekend) – all of which will be communicated to you when selecting your Access Point to make sure you get the right one. How do UPS Access Points work? 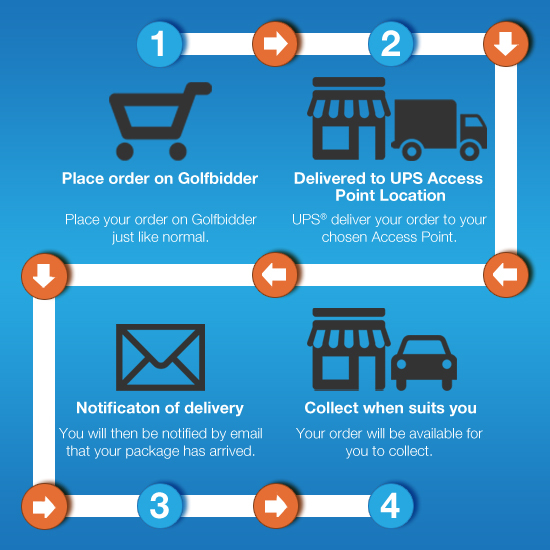 Using UPS Access points is so simple to use and is fully integrated to the checkout process on Golfbidder. When you’re ready to complete your order simply select UPS Access Points as your desired delivery method and follow the instructions. Once you have selected the Access Point that is most convenient to you from the ones suggested continue through the rest of the process as normal. You will receive an e-mail notification telling when your parcel arrives and is ready to collect. You then have 10 calendar days to collect your parcel at the chosen UPS Access Point. After the 10th day, your parcel will be sent back to Golfbidder. Collecting your parcel is very simple. All you need is Ask for the UPS parcel by your name and a form of ID from the options below. Government – issued photo ID – driver’s license, passport, foreign national or military ID – OR any other photo ID containing your full name, along with one of the following documents containing your full name: Utility/phone bill, council tax bill, wage slip, bank statement. If someone else is collecting on your behalf, he or she needs to bring your photo ID based on above criteria, as well as show his or her own government-issued photo ID. The UPS Access Point™ will record their signature, name, type of ID presented and the number of the ID on a PDA device for record purposes. You can drop off any package with a UPS prepaid label at a designated UPS Access Point location. Depending on what time of day you drop off your package, it will be safely stored at the UPS Access Point location and collected the same or next working day by UPS. Please contact us if you require a UPS Label. So where is my nearest UPS Access Point? To find a UPS Access Point or another convenient UPS location that suits your needs, click here.